On a quest to find a portable tankless water heater that you can use outdoors? That’s why we came up with this detailed review of one of the best products in the market today, the Eccotemp L10 Portable Tankless Water Heater. We understand that finding the perfect water heater that matches your every need can be stressful at times. Since 2004, Eccotemp has been among the leading manufacturers of energy-efficient water heaters. Through the use of the most advanced technology available, their experts continue to engineer eco-friendly yet affordable products that aim to improve the lives of families throughout the United States, Europe, and Australia. Portable tankless water heaters are preferred by those who are constantly on-the-go. Unlike traditional units, this type of water heater can be readily installed from one place to another. Although the initial investment is quite high, you get to save money in the long run in terms of your energy consumption. Compared to traditional water heaters, their tankless counterparts can last for up to double its lifespan, sometimes even surpassing the 20-year mark. They are also compact and do not take up too much space. 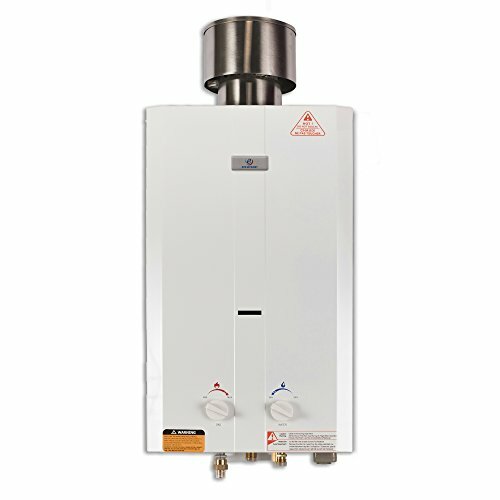 Among the many products that they offer is the Eccotemp L10 Water Heater. This water heater is intelligently designed to provide hot water wherever and whenever it is needed. It can be used to supply hot water to campers and RVs as well as in summer cottages, cabins, and lake homes. The Eccotemp L10 is a reliable outdoor tankless water heater that is perfect for camping, lake houses, cabins, and farms. This unit has an easy-to-store design and standard NPT fittings, which means that it is compatible with most plumbing fixtures. The L10 portable outdoor tankless water heater is equipped with a removable stainless steel rain cap that protects the unit from getting damaged by weather. If you purchase this product, you also get a CSA-approved regulator and a quality garden hose. This propane water heater has a manually operated control system that allows the user to adjust the water’s temperature to his personal preferences and needs. Additionally, it also has a water pressure control feature that can be used to adjust the water’s pressure levels from 20 to 80 PSI. Like most portable outdoor tankless water heaters, the Eccotemp L10 Portable Tankless Water Heater runs on liquid propane. For added safety precautions, they have been manufactured with a two D-cell battery ignition that only starts the flame when the water is running and an electricity supply is unavailable. This mechanism not only ensures that the unit does not overheat but it’s also a great way to save energy. Moreover, it also boasts a safety timer that automatically shuts the unit off after 20 minutes to eliminate the possibility of overheating. It has been tested and proven to have had delivered hot water supply at an elevation level of up to 5500 feet. The Eccotemp L10 Portable Tankless Water Heater is undoubtedly one of the top portable, outdoor tankless water heaters on the market today. It boasts a set of features that guarantee you get the best value for your hard-earned money. As mentioned above, this unit is a propane water heater and can supply up to 2.6 gallons of hot water per minute, perfect for up to two showers running at the same time. Its compact design and standard NPT fittings make it compatible with most plumbing fixtures. Equipped with a manual water heater and water pressure control systems, you can adjust the water’s temperature and pressure level to your personal preference. It has a back-up, battery-powered ignition system that only starts the flame when water is running. As a safety feature, the unit shuts off automatically after 20 minutes of continued use. A simple internet search about the best outdoor water heaters in the market today would provide you with hundreds of models and makes to choose from. Each one offers a different set of features that make the search for the best unit even more complicated. One of the leading competitors of the Eccotemp L10 Water Heater is the Camplux AY132 5L Water Heater. Compared to the Eccotemp L10, this unit from Camplux Portable Propane Tankless Water Heater delivers up to 1.32 GPM of hot water on demand. The ignition can also be started through its mechanism that is run by two D-cell batteries. This unit is compatible with any modified water system that has a 12-volt water pump. What makes the Camplux AY132 5L Water Heater stand out from other models on the market is that it can be installed as either an outdoor or indoor unit. For use indoors, the Camplux AY132 5L Water Heater needs to be connected to a well-ventilated and premium quality flue pipe that the owner needs to purchase separately. After carefully going over the features, pros, and cons of each of the above mentioned tankless gas water heaters, we have come to the well-informed conclusion that the Eccotemp Water Heater is the better choice, especially if you need a bigger water supply. The Eccotemp Water Heater is intelligently designed to deliver up to 2.6 gallons of hot water per minute. This supply can actually support up to two hot water applications that are running at the same time. This unit also has standard 1/2-inch NPT fittings that make it possible to be connected to most plumbing fixtures. The only downside that the Eccotemp L10 Portable Tankless Water Heater cannot be utilized as an indoor water heater unit. Nevertheless, it’s still among the best portable outdoor tankless water heaters in existence today.